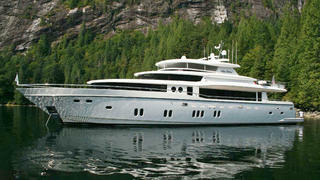 The 31.39 metre Johnson motor yacht Lady Caroline, listed for sale by Gilman Yachts, has been sold. Built in GRP by Taiwanese yard Johnson Yachts to a design by Bill Dixon, Lady Caroline was delivered in 2008. Accommodation is for eight guests in four cabins consisting of a master suite, VIP suite and two doubles, all with entertainment centres and en-suite bathroom facilities. In addition, there are quarters for three crew. The saloon has large side windows allowing ample daylight to flood in and there is a U-shaped sectional settee and two barrel chairs to port, while to starboard is a bar and an attractive wooden cabinet housing a 42-inch pop-up television and a stereo surround sound system. Forward is a custom wooden dining table with upholstered seating for six guests, while the galley is in a country kitchen style incorporating a large eat-in arrangement for casual snacks through the day. The aft deck is fully protected by the overhang of the deck above and has built-in curved seating, two varnished tables and a pair of deck chairs, making it the perfect location for al fresco meals during the day or evening cocktails. Up on the flybridge is a full helm seat forward to port, while aft are two L-shaped lounging areas facing a drop-down television screen, a walk behind bar with three bar stools, and a large built-in hot tub. Furthest aft is a stainless steel barbecue grill and a Besenzoni davit. Twin 1,825hp Caterpillar diesel engines give her a cruising speed of 18 knots and a maximum speed of 21 knots. Lying in Fort Lauderdale, Florida, Lady Caroline was asking $3,995,000.